Day 241, DeOccupy Honolulu at Thomas Square Park. 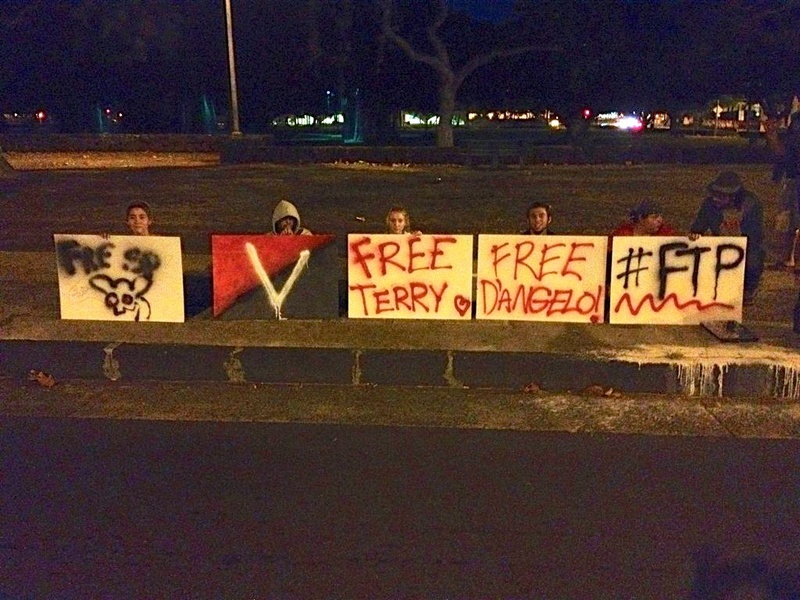 Last night at around 10.40 pm, Honolulu Police raided the DeOccupy Honolulu encampment and arrested two protest participants, Terry Anderson and D'Angelo McIntyre, charging them with being within the official park borders after the 10pm closing time. They were cited with more than just park violations as Terry's bail is set at $1,000 and D'Angelo at $600. A protest was immediately mobilized. This photo was taken around 2:36 am and was moved in front of the HPD headquarters shortly after. The arrests come after four consecutive raids last week by police and the Department of Facilities Maintenance (DFM). The police and DFM illegally seized tents and contents in last Thursday's raid after mainstream media press had documented the area 24 hours before. The seizures are being conducted under "Bill 54" (now ordinance 11-029) which requires items to be tagged 24 and left on property before being subject to seizure and impoundment. Protesters report Mayor Carlisle driving by during Thursday's raid to give a thumbs up to Trish Morikawa, the Coordinator of the Office of Housing who conducts the raids on DeOccupy Honolulu and homeless encampments. This escalation of attacks on DeOccupy which includes blatant violations of law in broad daylight must result from pressure from Mayor Carlisle who is engaged in a losing bid for re-election. Ironically, publicity from the attacks on the encampment resulted in an outpouring of support from the public who donated tents and other needed supplies to maintain the protest. This past Sunday afternoon's usual Food Not Bombs jam session attracted a large number of participants. "(De)Occupy Honolulu is in solidarity with Occupy Wall Street and the worldwide Occupy Movement which asserts that a democratic government derives its just power from the people, but corporations do not seek consent to extract wealth from the people and the Earth; and that no true democracy is attainable when the process is determined by economic power. We urge people to exercise the right to peaceably assemble, occupy public space, create a process to address the problems we face, and generate solutions accessible to everyone." I cant imagine Peter Carlisle actually supporting anything local. His not in for any changes to be made in oahu. He just wants to throw money around. When pigs fly and one will see Carlisle in the lead. Occupy speaks for the inequity of native Hawaiian people at the bottom of the poverty barrel. But, native Hawaiian are rich with trust funds, so where are the funds? Where are the needed services and why are we still living beside the road with our children. Why are the Waianae disabled elderly being treated unfairly by the Sheriffs office with tsars, batons and guns pointed at their heads. The inequity is mounting because of oppressive regimes in the Mayors office. Their actions upon the poverty leaves people sick, cause deaths, and children denied much needed education. I don't have answers or even understanding of what is taking place in Hawaii. Carlisle, former "Mr. Law and Order" prosecutor turned political hack, was defeated as Mayor. Carlisle used to be "Republican" till he sold his soul to special interest groups pushing rail and turned into a Republocarat or meaningless hybrid otherwise Democrat masquerading as a Republican. Or vice-versa. He wants a job with HART or a subcontractor for rail. Trisha used to work for him as a deputy prosecutor, that's how she got her job. Ironically, the pig union (SHOPO) didn't respect Carlisle enough to support him for re-election but went instead went for fellow union tool and "yes man," Caldwell. Both learn SHOPO could care less about them being former prosecutors. It's about union greed. Hey Big Brother, Little Brother is watching back!